New Jersey Devils coach Jacques Lemaire didn't hesitate when asked how long it would take his Olympians to recuperate from a physically demanding, emotionally draining two weeks in Vancouver. "Two weeks," Lemaire said. "It will also depend on which teams go all the way through to the final and how much rest they're going to get before they come back." Certainly not the most encouraging words from a coach who's team was 5-10-2 over its last 17 games while averaging just 2.25 goals per game over its last eight (2-5-1) prior to the Olympic break. While the men's hockey tournament at the Winter Olympics presented players an opportunity to fulfill childhood dreams and offer even the most casual fan quite a show during the final two weeks in February, let's face it, it most certainly wasn't what the doctor ordered with regard to rest and a regulated diet. "If you really look at it, there are only four teams that will go over the last weekend of the Olympics, so that won't be an issue," New Jersey goalie Martin Brodeur told NHL.com. After missing more than half the season with a biceps injury in 2008-09, New Jersey Devils goalie Martin Brodeur is making up for lost time. Brodeur, who played in just 31 regular-season games last season, already has played a part in 58 of 61 contests this time around. 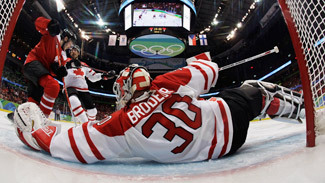 After earning his share of starts for Team Canada at a very emotional Winter Games in Vancouver, one has to wonder if Brodeur, 37, is capable of holding up down the stretch. "It's emotionally demanding and it might affect certain guys but most of these players (in the Olympics) are used to playing 25 minutes, but their time will likely get knocked down to 17 minutes because they're playing on all star teams, so it's a little different." Brodeur said he'll be fine physically. The key will be whether or not players can get their emotions in check after finally returning back to their NHL dressing rooms. "You have to put everything under check as far as your emotions are concerned and how you deal with the Olympics," he said. "It's not just for the final game, but throughout the two weeks. It's a tough place to be for the Canadian players but I think it'll be a fun time. During the NHL season, the guys are professional enough and in good enough shape that I don't think it'll be a problem especially since the Games are being held here (in North America). I remember coming back from Nagano (in 1998) ... it was a lot different than returning from Salt Lake City (in 2002) because the travel wasn't bad." Still, the Olympic break came at a time when tight races were being waged from the top of the standings to the playoff bubble teams of the Eastern and Western Conferences -- 26 clubs either hold a playoff berth or are within six points of a team that does. How's that for parity? Now, as teams prepare for the stretch run, there's a lot more to worry about than just X's and O's -- the fatigue factor also is an issue. You have to wonder. The New York Islanders have but one player competing in the Winter Games -- Switzerland defenseman Mark Streit. Does that give them an advantage? Keep in mind, the Isles are currently six points out of a playoff spot in the East. "The only thing to help (combat) fatigue is rest," Lemaire said. "There's no other thing than having the guys rest and not practice. Rest your mind." Lemaire's biggest concern coming out of the break is Brodeur. The record-setting goalie has already played in 58 of 61 games for the Devils and has gone 5-9-2 with a 2.75 GAA in his last 16 appearances. "With Marty, I don't know how much he's going to play or how it's going to be, but if he's involved, he's going to have a lot of stress there and he's going to accumulate fatigue," Lemaire said. "So to come back and play again -- it will be hard for him. It will be very hard for him. We'll see what we can do to take some of his fatigue away." Nashville Predators goalie coach Mitch Korn, who worked with two-time Hart Trophy-winning keeper Dominik Hasek for seven seasons with the Buffalo Sabres, said every player returning from the Olympics will hit a rut in the early stages of March. "After Hasek won gold (for the Czech Republic in 1998), I was in Buffalo and I remember they took a charter to Prague right afterwards and had a big party in the square before he got back for our first game against Toronto," Korn said. "Dom played and stopped 42 in a 2-2 tie. I can still remember that. But, there was a lull, and the lull in his game was after all the emotion and everything wore off. But Dom was one of those guys who kicked it back up. No one knows what's going to happen, but the guys who have played an enormous amount this season -- the Kiprusoffs, the Marty Brodeurs and Ryan Millers -- you have to wonder what impact it'll have on them come March. "With all that they've played prior to the Olympics, to be the main guy in the Olympics, and then have to play a very compacted March schedule is going to be interesting." Predators defenseman Ryan Suter is hoping he can take the momentum and spirited play he possessed for Team USA right through the remainder of the regular season. "Hopefully, we'll still be running on adrenaline in March and push through," he said. "We obviously would like a good spot going into the playoffs, so we'll just have to recharge the batteries and make a good run." Team USA captain Jamie Langenbrunner agreed with Suter. "I think everybody will react differently," Langenbrunner told NHL.com. "Some guys are going to have a decent break afterwards -- if the tournament ends earlier. But I think you can take it two ways. You can take the negative that you're playing extra hockey and that it's going to drain you a little bit. Or, you can take the positive that you're playing at a high level and it'll boost your confidence. I think most guys will ride that and use it to catapult them into the last quarter of the season." Said Team USA alternate captain Zach Parise: "As long as you play smart and take care of yourself and your body when the Olympics are over, you'll be fine. It's going to be tough because you're going right into the heat of things with the playoff drive." Nashville coach Barry Trotz, whose team missed the playoffs for the first time in five seasons in 2008-09, had six players representing five countries at the Winter Games. He said those players with Olympic experience will fair better than those players without. "For some of the players and, even more, the lesser known countries in terms of power rankings, the Olympic experience might actually invigorate them and they'll probably be back a little bit earlier so they'll get a slight break," Trotz told NHL.com. "For some of the players on Team Canada, Team USA and Russia, the pressure and expectations put on them by their countries is pretty significant. "The Canadian players are the ones who are going to be affected the most because of the high expectations in Canada," Trotz continued. "Mentally, they may be really drained out of that experience. It could be invigorating if they get gold but, then again, if they don't it could work against them."